Bristol County Sheriff Thomas Hodgson, who is totally not a fascist, nope, wants elected leaders of cities that have declared themselves sanctuary cities arrested, WHDH reports. When last we heard from Hodgson, he was offering to ship some of his inmates down to Texas to build Trump's wall. UPDATE: Curtatone responds: Come at me, you jack-booted thug. 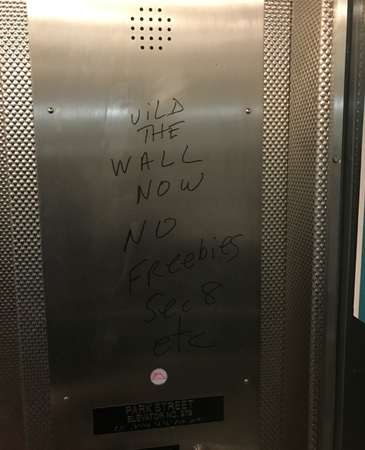 Via e-mail this morning, we got a photo of some some graffiti in an elevator at the Park Street T station that seems to indicate the author's carefully considered desire to build a wall to keep out Section 8 recipients. Our correspondent reports he notified the T, which promised a cleanup crew was on the way. NBC Boston reports on a Saturday incident in which a Proud 'Murrican in Malden decided to scream at a couple of Dunkin' Donuts workers that "Trump is here go back home!" Another woman in turn started screaming at her to shut the frick up and go home herself. The aggressor pushed/threw the victim on top of me as I was sitting and started punching him. My glasses were broken and head scraped in the process. 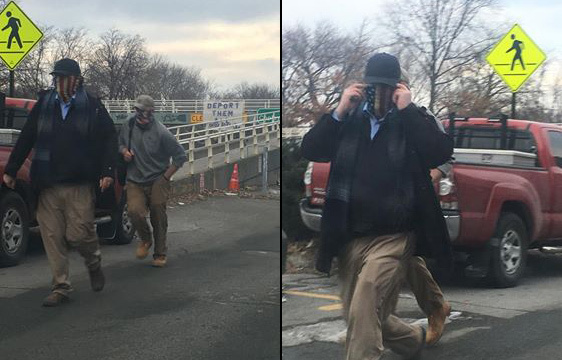 Transit Police report arresting a Malden man on charges he determined the best way to make his point in a political discussion early this morning on a train to Forest Hills was to pull his pants down and show just what a man he is. Or as Transit Police put it: Read more. The Globe reports: Yes, they took a victory lap around Wellesley College, no, they didn't spit at anybody or yell slurs. Cambridge Day reports on swastikas and other unspecified "hateful language" that appeared in three boys' rooms at Cambridge Rindge and Latin School this week. Wicked Local Brookline reports on the incident at the Lincoln School and the reaction of school officials. The East Boston Times-Free Press reports on what a non-Hispanic student at East Boston High told his largely Hispanic classmates what they could do with themselves after the election. BPS says it was an isolated incident. The note to Sanford Levinson is every bit as charming as you'd expect. Mailed from England. In Springfield, a Puerto Rican couple woke up to have their door keyed, ‘go home.’ In Attleboro, we saw graffiti in the schools, the N-word and the KKK. Last week, there were Ku Klux Klan newspapers dropped on doorsteps in the town of Milford. We had reports of a black woman and her daughter who claimed to have been run off the road - literally, they were in their car. Three 15-year-olds told a woman on the Red Line to go back to her own country before one of them began beating her with her fists and a phone as the train traveled between Savin Hill and Andrew the day before the election last week, the Suffolk County District Attorney's office reports. Read more. 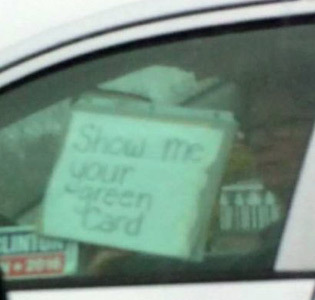 AmyG forwards this photo from a friend who was driving into Boston today when she noticed this woman next to her waving that sign at her: Read more. People who really are opposed to the Trump presidency are warning other people away from an alleged anti-Trump rally Friday night on the Common. No, don't show up at the Common prepared for "an intimidating show of force" in which to "smash the fascists." UPDATE: Now the page is for a neo-Nazi pep rally. LiberalBadIdeas spotted this on the Red Line. Meanwhile, in Cambridge, Harmann Singh, a student at Harvard Law School, reports tonight: Read more. One of the Babson dudes who drove around Wellesley College to taunt students there after the election apologized today for being a jerk. No word if his apology is enough to get him back into his frat, which kicked him out. The Walpole guy who posed in front of a local Mexican restaurant with a large Trump banner, then posted on Facebook that the owners would be paying for the wall, apologized - by way of a full-page ad in the Walpole Times. He says he meant no offense, he was just in a joking kind of mood and besides, it was only that he's a Facebook dunce that he made the post public.